According to Carter et al. (2014): “Grasses with attached dead leaves are more productive than grasses from which the dead leaves have been removed. Loss of these dead tissues to grazers increases thermal damage to the growing shoots and reduces the vigor of the entire plant .” According to the reference section in Carter et al. (2014) reference 28 is Sauer (1978). Clipping to the crown is much shorter than 80 percent utilization. Normally, the recommended utilization level for livestock grazing is 50 percent. Dead Leaves: Sauer (1978) didn’t just remove dead leaves from dormant bluebunch wheatgrass (BBWG), he removed all dead plant material: leaves, stems, nodes, sheaths and inflorescences. Grazers: Carter et al. (2014) doesn’t define grazers. 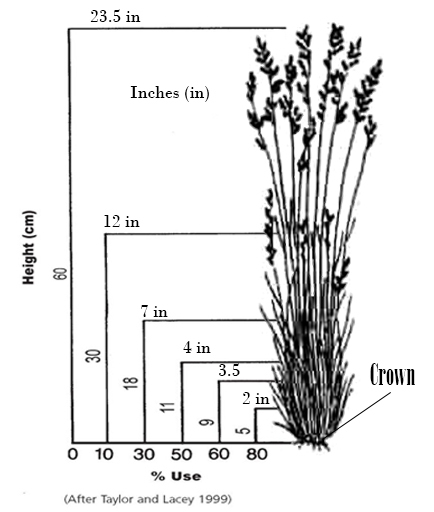 In Sauer (1978), BBWG plants were not grazed they were clipped with scissors to the crown leaving no stubble. Clipping was much more severe than almost any livestock grazing. Thermal damage: Sauer (1978) doesn’t mention thermal damage or plant vigor in his paper. Vigor: Sauer (1978) reported that clipping all standing dead from BBWG did not change the number of flower stalks or the height of the flower culms plants produced than when compared to unclipped plants. BBWG vigor can be determined by combining the number of flower stalks with the maximum length of flower culms (Mueggler 1975). Basal area has also been used to measure vigor (Clark et al. 1998). Sauer (1978) reported the basal areas of clipped plants were not different from unclipped plants. Thus, BBWG vigor was probably not affected by removing dead material from BBWG plants. So what did Sauer (1978) find? He found that removing all standing dead material decreased the weight of new leaves and stems by 28%, decreased the loss of standing dead by 21% and decreased leaf length by 25%. Sauer concluded that standing dead is not a deterrent to growth and beneficial to bluebunch wheatgrass. Clark, PE, WC Krueger, LD Bryant, And DR Thomas. 1998. Spring defoliation effects on bluebunch wheatgrass: II. Basal area. J. Range Manage. 51:526-530. Mueggler, W. F. 1975. 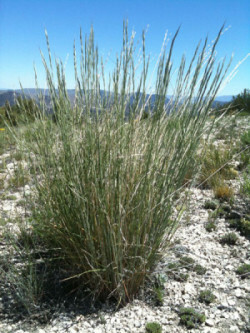 Rate and pattern of vigor recovery in Idaho fescue and Bluebunch wheatgrass. J. Range Manage. 28(3): 198-204. Sauer, R.H. 1978. Effect of removal of standing dead material on growth of Agropyron spicatum. Journal of Range Management 31:121–122.